Iron Mike vs the Lion - who wins? One thing that will always disappoint me is that I never got to see Mike Tyson or Lennox Lewis fight in the flesh. Ricky Hatton coming back is great and I'm sure I'll see him in the future, and there are plenty of great fighters around now, but it pains me that I'll never see two of the best heavyweights show their stuff in the ring. That's why I'm going to ask you to humour me on this one. 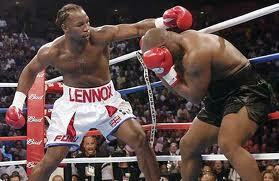 Let's talk about Mike Tyson vs Lennox Lewis. I know they already fought, and we all know what happened then, but let's assume prime for prime. Who wins? How? Is it a good fight, or do you think the two are miss-matched? Here are the stats on both, including fight record and physical information. It should help you make your pick. There's a massive physical advantage for Lewis here, and history has shown us what actually happened when these two met. Prime for prime, I don't think it would be much different. Lewis wins this by KO. I asked you guys on Twitter what you thought of the match up. Steve Howell: Lewis the pugilist wins with his size and reach. Even out the height difference and Tyson sparks him. Chaz Cairns: a prime Mike Tyson vs a prime Lennox Lewis ends by a 1st round KO by Tyson. Fact.